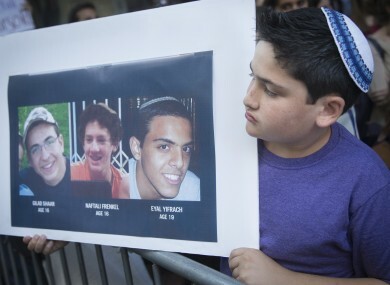 A memorial for the three dead teenagers was held yesterday. ISRAEL HAS VOWED to make Hamas pay for the murder of three kidnapped Israeli teenagers, but the Islamist movement warned any reprisal attacks would open “the gates of hell”. Israeli Prime Minister Benjamin Netanyahu yesterday evening announced the discovery of the three bodies in a field in the southern West Bank. “This evening, we found three bodies and all the signs indicate that they are the bodies of our three kidnapped youngsters,” Netanyahu told ministers at the start of an emergency session of his security cabinet. “They were kidnapped and murdered in cold blood by human animals,” he said. “If the occupiers carry out an escalation or a war, they will open the gates of hell on themselves,” Hamas spokesman Sami Abu Zuhri told AFP. The discovery of the boys’ bodies — one 19-year-old and two aged 16 — came 17 days after they disappeared, triggering a huge manhunt during which five Palestinians were killed and more than 400 arrested. Israeli public radio said on Tuesday that the youths were apparently shot dead shortly after they were snatched. Two Hebron Hamas men named by Israel as prime suspects — Marwan Qawasmeh and Amer Abu Eishe — remain at large but Palestinian witnesses said troops blew up their homes early on Tuesday. The Israeli roundup, mainly of people linked to Hamas, brought a wave of rocket attacks against southern Israel by militants in the Gaza Strip, answered in turn by Israeli air strikes. The latest round began around 1:00 am on Tuesday (2200 GMT on Monday) with a rocket slamming into open ground in the Negev desert region. Two more followed overnight, the army said, but nobody was hurt. The Israeli military said in a statement that aircraft hit 34 targets. In the northern West Bank, Israeli troops shot dead a young Palestinian early on Tuesday during a raid into the Jenin refugee camp, Palestinian security and medical officials said. They named the dead youth as Yusuf Abu Zagher, 18. An Israeli military spokeswoman said that he was a Hamas operative about to hurl an explosive device at troops sent to arrest him. “They opened fire and confirmed a hit,” she said. She did not say if the arrest raid was related to the broader crackdown on Hamas in the West Bank. The Israeli youngsters’ bodies were found near the West Bank town of Halhul, some 10 minutes drive from the roadside where they were last seen hitchhiking. US President Barack Obama condemned the killings and warned against actions that could further “destabilise” the situation, amid the threats of retaliation against Hamas. “The United States condemns in the strongest possible terms this senseless act of terror against innocent youth,” Obama said in a written statement. British Prime Minister David Cameron slammed an “inexcusable act of terror” and pledged to stand with Israel as it seeks justice. French President Francois Hollande denounced the “cowardly murder” of the teens which German Chancellor Angela Merkel called “a detestable act for which there is no excuse”. Hamas has dismissed the Israeli allegations as “stupid” with Abu Zuhri accusing Israel of fabricating the kidnapping as an excuse to crack down on the movement. “The occupation is trying to use this story to justify its extensive war against our people, against resistance and against Hamas,” he charged. Pope Francis, who last month visited Israel and the West Bank, called the killing “an abominable crime”. “This is a serious obstacle on the path to peace for which we must continue to pray and continue to be involved,” a Vatican statement quoted him as saying. Email “Israel: Hamas will pay. Hamas: Start a war and you'll open the gates of hell”. Feedback on “Israel: Hamas will pay. Hamas: Start a war and you'll open the gates of hell”.